Thirty-five years ago a collector traded some duck decoys for an item inside a Sunbeam electric iron box. 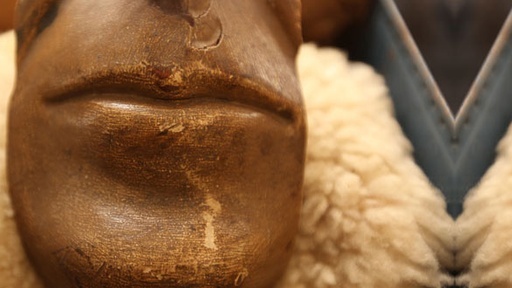 This item was wrapped in sheepskin, a mouth and chin carved out of wood. Articles and a letter at the bottom of the box say this mouth was part of a figurehead of President Andrew Jackson affixed to the bow of U.S.S. Constitution until protestors vandalized the carving in the 1830’s. Could this wooden mouth have once adorned U.S.S. Constitution? History Detectives gets clues from a U.S.S. Constitution historian, and a historian in 19th century woodcarving. Related Investigation Monroe Letter Does this letter link America's President to the high seas piracy of U.S. merchant ships in the early 1800s? Also in Season 9 Civil War Letters What can these letters reveal about a racially-charged massacre on a Civil War battlefield? Also in Season 8 Mussolini's Dagger Did a World War II GI return home with Mussolini's dagger? Also in Season 8 Special Agent Five How did this tale of robbery and murder help FBI director J. Edgar Hoover consolidate his power?